A young would-be David Attenborough, visiting my home, asked me ... "do cats dream?" Have you ever wondered whether a sleeping cat's having dreams? And if so, what it is they're dreaming about? 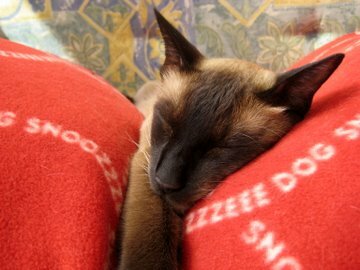 Do cats dream? Can we know for sure? The answer is almost certainly yes, if my cat Bandit is anything to go by. I've watched him for hours, deep in sleep, a cat dreaming of … who knows what? Mountains of food? Mice, frogs, squirrels? Dogs - or foxes, perhaps? A bit fanciful, I know, but he does seem to have vivid and sometimes even alarming dreams. These things don't always happen all together, and of course any one of them by itself could have been caused by something else entirely – indigestion perhaps, or nerve twitches, or itchy skin. So do other owners think their cat dreams? Whenever I've mentioned this to other cat owners, most of them have said they thought they'd occasionally seen their cat dreaming. Most of them can also list reasons why they think this happens, similar to the signs I've shown above. And dog owners I know also say they think their dogs have dreams and chase things in their sleep. Scientists involved in studying sleeping animals have used EEGs to measure brain activity, and found from this that animals spend a fair amount of time in REM sleep. REM, or rapid eye movement sleep is the phase of sleep during which humans have been shown to dream, so it's tempting to suppose that animals respond in the same way. The scientists also found that REM sleep in animals was accompanied by many of the activities I listed, so the general feeling, at least for the moment, is that animals do dream. For me, the clincher is that as well as the signs I listed earlier, when my cat's asleep the fur on his back sometimes stands on end and his tail puffs up to twice its normal size. This is a sure sign that a cat is frightened or disturbed by something, so for me this was all the proof I needed that cats dream as he seemed to be visualizing something he was afraid or wary of. Sadly, what a cat dreams about is, of course, something that we'll probably never know! 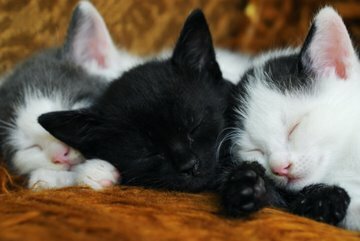 Do cats dream? What about kittens? Top of "Do Cats Dream?"